75 popular guitar effects and 65 built-in rhythm accompaniment patterns in one convenient pedal. Zoom's G1on offers 75 guitar effects, including a variety of distortion, compression, modulation, delay, reverb and amp models. 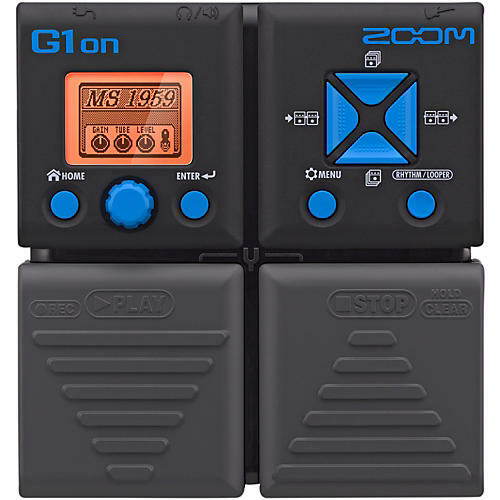 The G1Xon offers an additional 5 pedal-controlled effects. Advanced features such as Copy and Swap make it easy to organize your patches for live performance. An Auto Save function ensures that your edits are stored automatically, and a Pre Select feature allows you to scroll through patches silently while keeping the current patch operational. Twelve exceptional boosters, overdrives, fuzzes and lead guitar sounds, including simulations of the BOSS OD-1, MXR Distortion+, Marshall Guv'nor, Fuzz Face, Big Muff and Pro Co Rat. Our ExtremeDS effect offers the most powerful gain of any distortion effect in the world, and there's also a simulator that allows your electric guitar to sound like an acoustic. Twenty-two ultrarealistic models, including simulations of classic tube and solid state amps from manufacturers like Fender, Marshall, Vox, Hiwatt, Mesa Boogie, Orange, Bogner, Matchless and Diezel. The amp sounds are so lifelike, you'll swear on a stack of speaker cabinets you're listening to the real thing. Fourteen delays and natural-sounding reverbs, including rooms, halls, plates, springs, and tape delay simulators, all designed to add depth and spaciousness to your sound, with delay times of up to four seconds. You'll even find reverse delays, modulated reverbs and particle reverbs here-everything you need to place your guitar in a realistic space ¦ or a totally unearthly one. Dial-in some footstompin' rhythms and tones with this special pedal. Order today!